1. Place the rice in a small saucepan with 300ml water, cover and bring to the boil, then simmer for 10-15 minutes until tender and all the liquid had been absorbed. 2. Meanwhile, heat the oil in a wok or frying pan and stir fry the pepper, carrot, beans and mushrooms for 5 minutes. 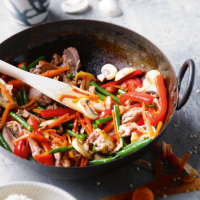 Add the duck and chilli sauce and cook for 1-2 minutes. 3. Serve with the rice. This recipe was first published in Thu Jan 15 10:05:45 GMT 2015.